高坂穂乃果(CV.新田恵海)、南ことり(CV.内田 彩)、園田海未(CV.三森すずこ) - ススメ→トゥモロウ / START:DASH!! 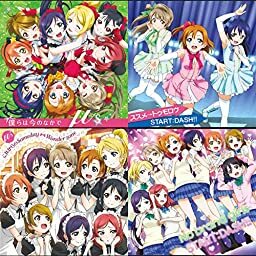 μ's - No brand girls / START:DASH!! 星空 凛 (CV.飯田里穂)、西木野真姫 (CV.Pile)、小泉花陽 (CV.久保ユリカ)、絢瀬絵里 (CV.南條愛乃)、東條 希 (CV.楠田亜衣奈)、矢澤にこ (CV.徳井青空) - Love wing bell/Dancing stars on me! μ's - Love wing bell/Dancing stars on me! μ's - KiRa-KiRa Sensation!/Happy maker!